Luxy Hair sells clip-in hair extensions. That isn’t very special on the surface. Many companies do that exact same thing, in basically the exact same way. But the real interesting thing about Luxy Hair is that they have a YouTube channel with over three million subscribers! Luxy Hair was founded by a husband and wife team in 2010 with zero followers and zero money. Alex (the husband) was even let go from his job around the same time. 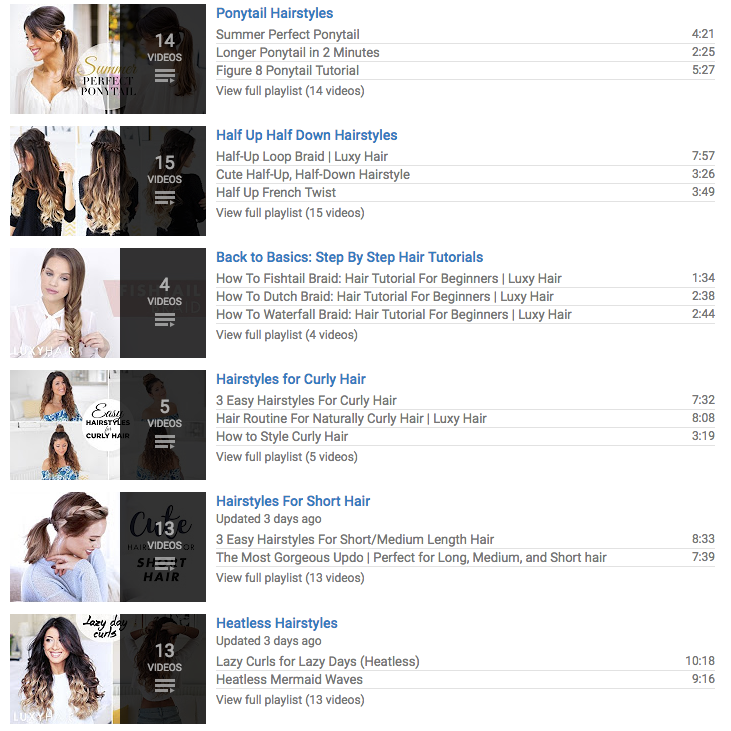 So how’d they go from that inauspicious start just a few years ago to now dominating anything to do with “hair” on YouTube? He’s been able to boil their YouTube content success which has single-handedly grown their business into a simple formula he calls: QVCA. Let’s take a look at each step in detail to see how it works (and more importantly, how you can do the same). Skimping on written blog content isn’t always a big deal. It’s not ideal obviously, but it’s not always a deal breaker, either. The reason is that it takes a trained eye to spot the difference between minor mistakes, like using active voice instead of passive. So many of those issues fly under the radar. That doesn’t happen with video. Instead, video often amplifies all of your little mistakes. For example, you need an expensive camera right off the start to get a crisp video. Filming without soundproofing can make the entire video sound ‘hollow’ and echoey. Then if you get the lighting wrong, it’ll seem like you’re hiding in a dark corner. To make matters worse, we’ve all grown up watching TV and movies in HD. Especially now when you can fire up a hundred-million dollar blockbuster from Netflix on your iPhone, and the resolution is perfect (without a single lag). Now, there is some good news thankfully. You don’t need to have Michael Bay-level production. In fact, many times less production can actually be a good thing. Most people on YouTube are looking for personal, intimate content. So it doesn’t need to be over the top. Fortunately, there are a few tricks that can make a massive difference in the finished product. “Good video is more about what’s taken out than what’s left in,” according to YouTuber Tommy Walker. The first editing phase involves planning out how and where you’re going to film, what you’re going to say, and what (if any) camera angles there will be. Here, you’re blocking out how you want the overall video to play out. This way there are no surprises, and you can simply worry about executing when the time is ready to hit record. 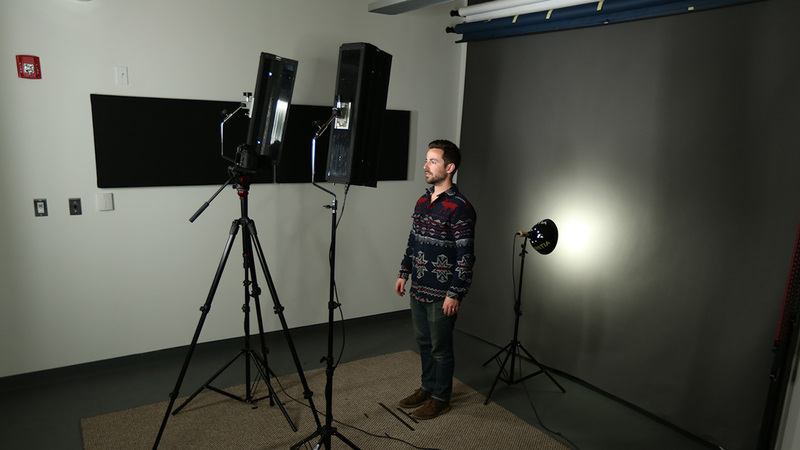 You’re getting virtually an entire studio setup for only $150 bucks. Then, make sure your camera angles are positioned at an angle that looks down on the focus of your video. This will remove any excess content that doesn’t need to be there. Here, you’re shaping the ultimate vision people will see and how that experience will play out. Many times that involves lots and lots of cuts. “It has been said that on the average 90-minute movie there are over 5,000 cuts. Editing is what makes the video. It controls the pace of the story,” according to Tommy. 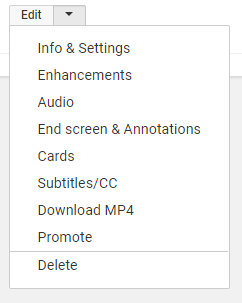 A great way to save time on post production is using YouTube to cookie-cut the settings. 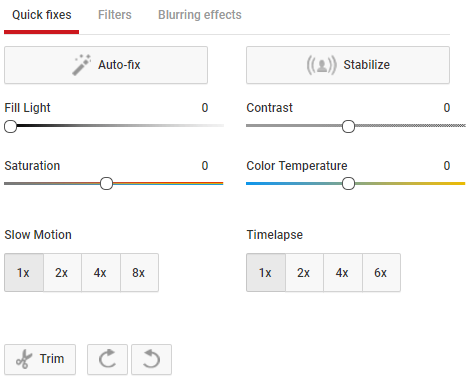 You can use the “Enhancements” option to test out various filters and settings that you can save for your next upload. Start by editing the light, saturation, contrast or add filters. This is an easy way to create beautiful content in less time, with less skill required! He uses consistent branding and templated YouTube settings to quickly upload and perfect his video. 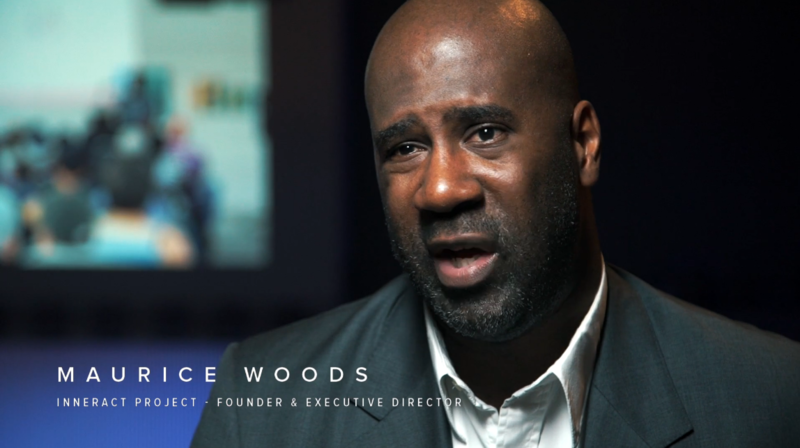 The time-consuming aspect of editing is confirmed by Clair Byrd of InVision, who reported on her own experience in producing a documentary called Design Disruptors. She noted that it took 18 months to produce, and in the end, they had to edit 400 hours of filming to be condensed into 10. Think about it like a sculpture. 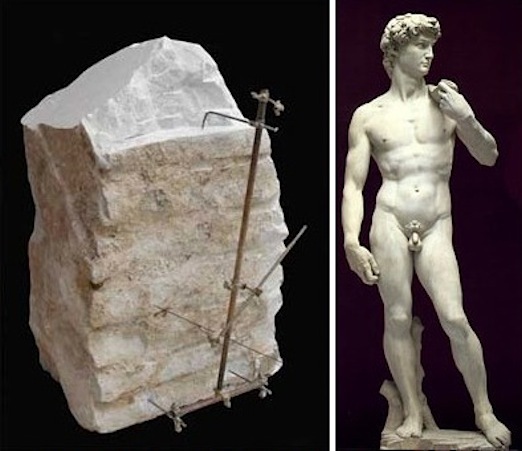 Michelangelo’s David started as a block of granite. There’s a tale about Michelangelo’s response to someone who was wondering how he could create something so amazing and he supposedly gave this curt reply. Whether that actually happened or not isn’t the point. Instead, it’s to purposefully whittle away all of the excess material that doesn’t significantly contribute to telling the story. Determining the ‘value’ of a piece of content can be subjective. However, there’s one easy trick you can try that will help you craft a better story and use the tool of persuasion. The old PAS copywriting formula (Problem, Agitate, Solution) helps provide a framework to work within. In this case, the value would ultimately be the way you solve that problem for someone. And the story would be a build up to that solution. Our brains crave stories. We’ve used stories to communicate since the beginning of time. Literally — for the 27,000 years we’ve been walking this Earth. Today, personal stories still make up to 65% of our communication with each other. Studies have revealed that our brain centers light up when we’re being told a good story. 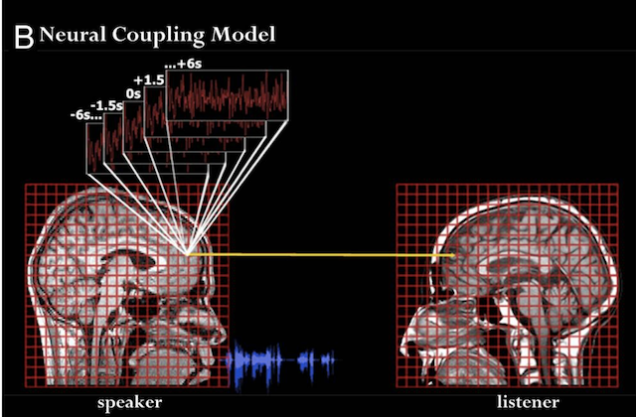 Both the speaker and listener’s brain activity will mirror each other. First, outline the problem. Are you selling a product that solves a problem? It’s tough to function during the day when you’re always tired. We work all day and then repeat again the next only to find the same roadblocks. And when you’re tired, your work is sub par, and even your co-workers start to notice your lack of productivity. But, thankfully, you can use *insert product* to up your productivity every day. In some cases, the value could simply be entertaining. Making someone laugh or moved to the point of tears is a powerful response that builds loyal fans. Otherwise, in more business-y scenarios, showing people a few simple tips to get rid of bed bugs or how they can slash advertising costs by 70% can deliver a literal value. You could even measure value as the cost they’d normally spend to get the same information (e.g., a $5 magazine). Business sales and deals are all based upon value exchanges. The “P” part of the PAS formula also makes you do something unconventional: Start with something that potentially has nothing to do with your product or service. That means your videos aren’t directly about your product or service per se. 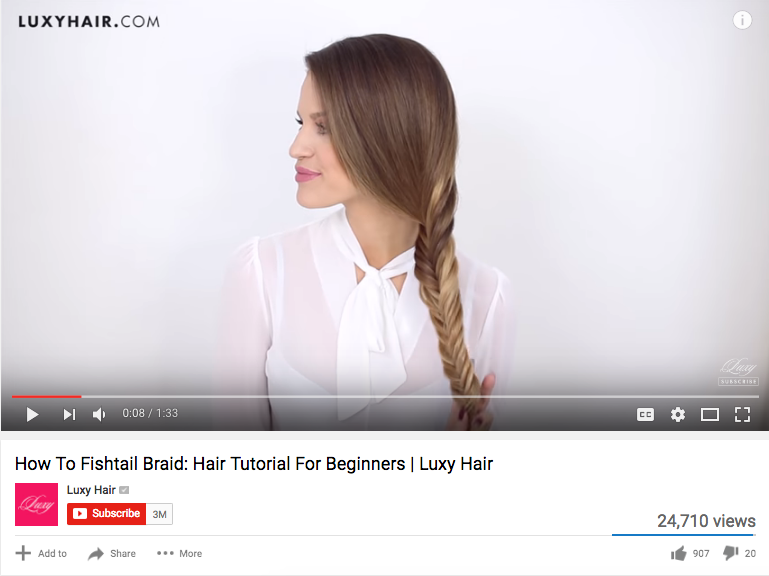 Luxy Hair sells hair extensions, but the objective behind their videos isn’t to sell hair extensions directly. Instead, they want to dominate mindshare by solving all of your potential problems around hair. Like how to create a braid, for example. Luxy says that even if a person isn’t necessarily looking to buy hair extensions, they can use the PAS formula to present them as the solution. In other words, the value can be delivered through storytelling and making a compelling case. Think about all of your favorite movies. All of the ones that you go back to again and again. Chances are, each one is driven by a classic storytelling archetype. For example, the ‘reluctant hero’ is one of Hollywood’s favorites. The reluctant hero in Willy Wonka is poor little Charlie. In the Lion King, it’s Simba. They reject their ‘true destiny’ at first, only to eventually come around at the end of the day. Challenge: Someone has to rise up and face adversity to eventually triumph. Connection: This one bridges a gap against all odds (like Romeo and Juliet). Creativity: Now you solve a problem in a unique, unexpected way. The trick is that your customer, not you, is the ‘hero’ in these stories. They’re the ones rising up and conquering the demons holding them back from getting what they want in life. You’re just the storyteller behind the scenes that’s narrating their life story. Today there are over two million blog posts published each day. That means the quality bar continues to rise, too. 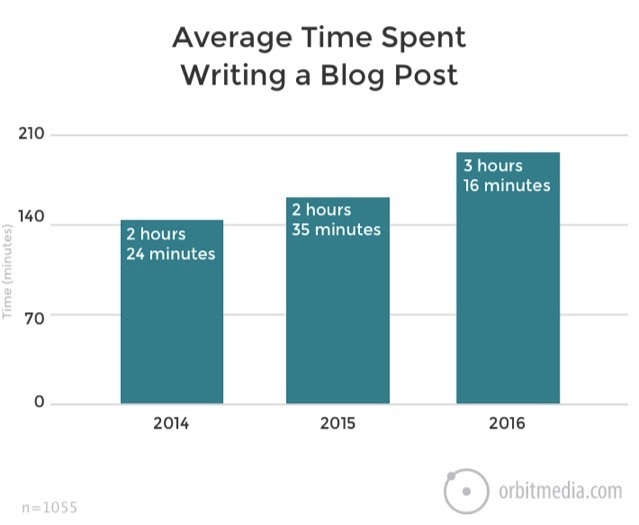 For example, years ago a 500-word blog post would only set you back 1-2 hours. While today those 2,000-4,000 word posts might anywhere from three hours on up to a full day to produce. That’s why a key component of ‘consistency’ is finding your specific niche. In other words, consistency creates success when you can publish dozens and dozens of high-quality videos in a specific niche over the course of more than five years. All of a sudden, you eventually become an overnight success that was a decade in the making. ‘Niching down’ makes this easier because it focuses your resources. Every company is short on time, money, energy, and labor. Simply put: You can’t afford to put 10% into ten different activities You’ll never make any headway in any of them. Instead, you need to put 100% behind one approach, targeting one audience. Finding a niche also isn’t that difficult. It doesn’t mean you have to only have one buyer or one product. It just means you pick one to prioritize. Chris Drucker suggests a quick keyword analysis to determine which ones receive the (1) most volume or demand with the (2) least amount of cut-throat competition. You can determine if that niche has demand by looking at the traffic and volume numbers. This free tool will give you tons of data on your keyword and related searches that will help you craft out a niche that’s popular, yet low on the competition scale. Ad guru Perry Marshall’s favorite technique is to do a quick 80/20 analysis. The goal is to look for your past services, customers, or even locations to determine which resulted in the most profit. Your goal is to rule out the ‘average’ performers in all categories to leverage as much time, energy, and money behind the ‘winning’ combinations. What 20% of my process is creating 80% of the problems? What 20% of my process is creating 80% of the undesired outcomes? Then, use this to identify what videos you’re producing that are taking too long and not giving you the outcomes you need. For example, if you have a shorter, less detail-focused video, you might realize that you don’t need to spend hours editing it for only a little extra return. What systems are holding you back? 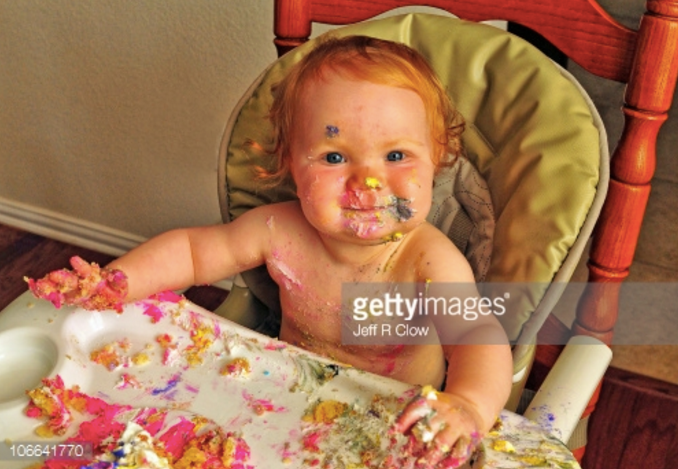 “Authenticity” is the most important factor behind a powerful visual according to Getty Images. Here’s an example of how that looks. Obviously, it’s cute. But you can also tell it’s somewhat staged and slightly corny. Almost ‘overproduced’ you might say. Now compare that to their most popular baby photo from a little more recently in 2012. Adorable. This one’s more realistic and natural, like something you’d see on a friend’s Facebook profile. Luxy Hair practices authenticity by embracing what they know, and more importantly, what they don’t know. Mimi’s channel isn’t focused on trying to be the best hairstylist in the world. But rather it’s about her being a regular person trying to learn and teach others about her experience. They started out by making simple videos on their laptop. Obviously, the production quality was less than ideal (despite still being viewed over 700,000 times). In recent years they’ve upped the ante to make sure each video they put out passes their own quality standards. However, they’ve also seen that going overboard on production can actually backfire. When they eliminated bloopers or fails, they found that people lost interest and engagement actually declined. In other words, people loved their bloopers or mistakes that made them quirky and entertaining. Keep in mind what medium you’re on here. YouTube isn’t Netflix. People know that and expect a more personal, down-to-earth approach. So while the production needs to be good, it also doesn’t have to be amazing. User-generated content is a great way to produce authenticity and craft a relatable YouTube channel. Take insights from your subscriber base, and listen to the comments section to get ideas for videos. They allow subscribers and commenters to contribute to their video with suggestions, making them much more relatable and accessible than a cold, distant uploader who doesn’t listen to their fans. And then be sure to give credit to each user if you use their idea! After you’ve created your QVCA-based content, you need to start promoting it. Start by sharing your content on social media. But, share it more than once and repurpose the content to share multiple different angles. 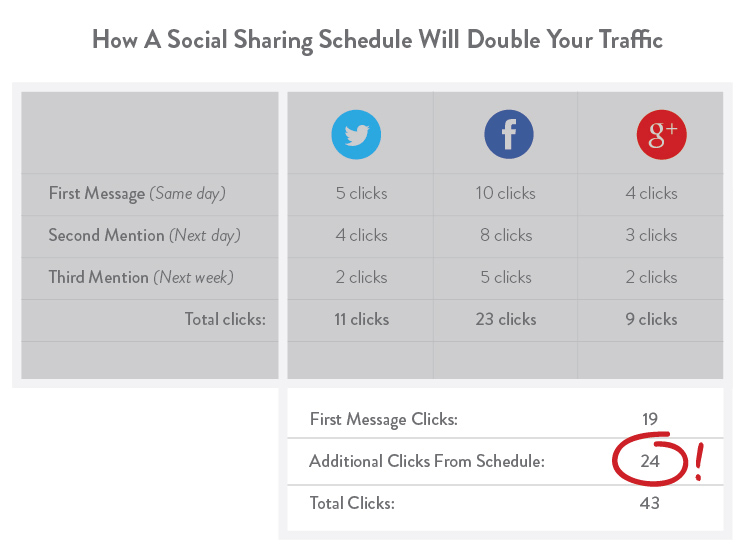 Sharing content more times on social media will get you better results. Even if you are simply sharing the same content. It will only help you get more clicks, views, and traffic. Once you’ve begun to promote your content, a great way to make it go viral is by prospecting and outreaching to blogs or news outlets that have posted similar content. To get started, use a tool like Buzzsumo to search for similar content. Now, you have a huge list of websites that have posted or shared viral content about that topic. I watched your video on *insert video name*, and loved it! 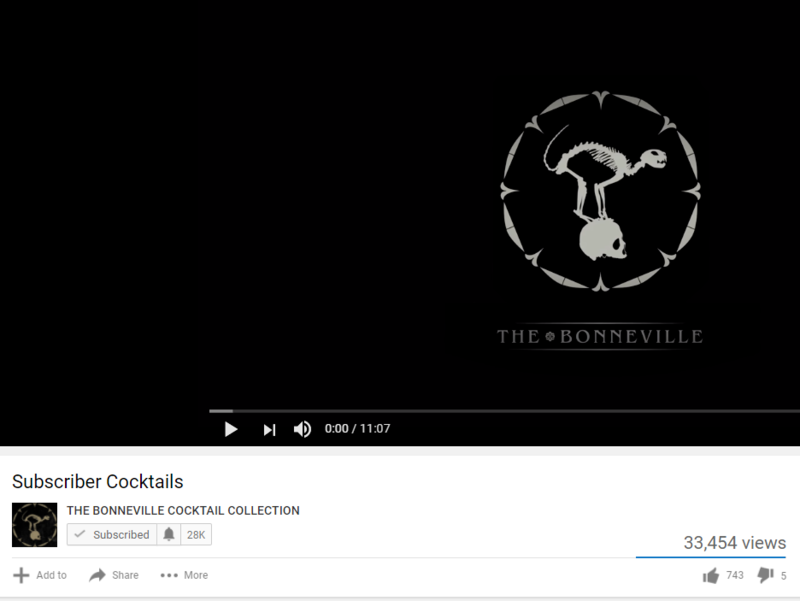 I actually just created a video like that myself, and it’s gaining some traction. Can I send it to you for some feedback and constructive criticism? Using a basic template like this will help you get your video more views, and if they like it, you can ask them to share it on their social media or website to create a snowball effect of traffic! How have you used YouTube to build a business? Becoming famous and building a company is nothing but a pipe-dream for most people. But, if you develop a specific, processed formula, you can find success with your own business too. 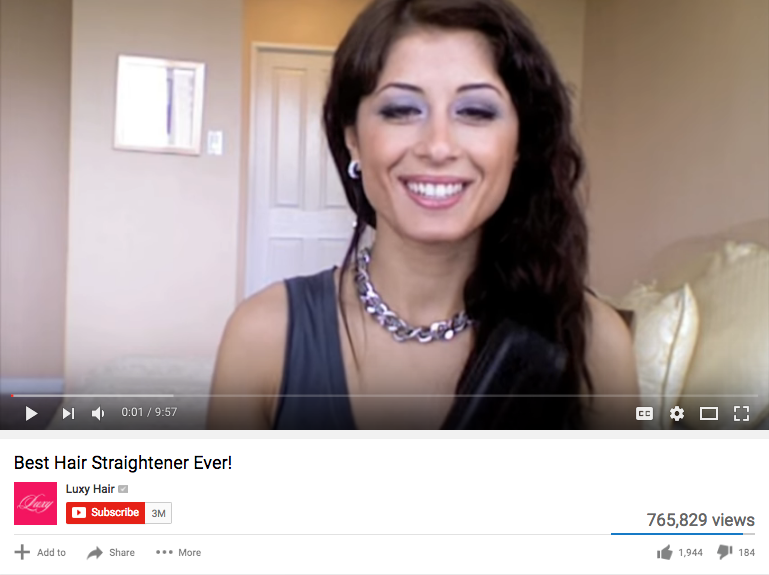 And that’s exactly what Luxy Hair was able to do on YouTube. Try stepping up your YouTube video quality to meet today’s standards of production. You can’t risk having bad-quality content when most people are filming in 4k. Deliver more value with storytelling and proven formulas of driving engagement like the PAS formula. Develop better consistency in your uploading and appear more authentic by engaging with user-generated content. Lastly, promote your content like there’s no tomorrow. What tricks have you used to get more subscribers? Have you used some of these same steps to use video to skyrocket revenue? Share your best tips in the comments below!